There are several reasons why you might cough up blood. Some of them can be minor, but some are life-threatening. Coughing up large amounts of blood is a medical emergency. Phone 111 for an ambulance immediately. Most people cough up only small amounts of blood. It may look like flecks of blood on a tissue, or it may be mixed in with the phlegm, making it look brown. Coughing up blood may be the only symptom or it could come with other symptoms such as breathlessness, chest pain, a high temperature or a blocked nose. Even if you are coughing up just small amounts of blood you will need to see a doctor urgently to find out what is wrong. 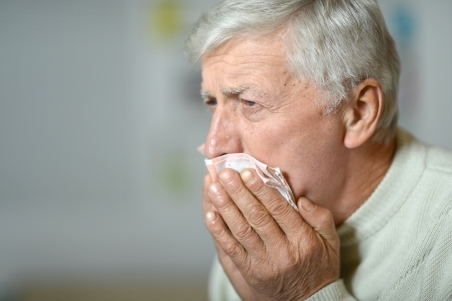 Some of the conditions that can make you cough up blood are serious. It's often difficult to know exactly what the cause is without further tests. What can make someone cough up blood? Several things can make someone cough up blood. Causes include infections in your sinuses, chest infections such as pneumonia or bronchitis, tuberculosis (TB), lung cancer, and a blood clot in your lungs called a pulmonary embolism. Occasionally doctors can't find a cause. If you have an infection then you may need antibiotics, although most cases of bronchitis and sinusitis are caused by a virus and you will not need antibiotics. Your doctor may ask to see you again to check that you've made a full recovery and have stopped coughing up blood. You may need tests such as a chest X-ray, blood tests, or a sputum (phlegm) sample for cytology or culture (depending on what your doctor thinks is causing your haemoptysis). If your doctor suspects a serious cause, they may refer you for a CT scan of your chest, or to the hospital to see a hospital specialist. This page explains how your lungs work, and all the different conditions that may make you cough up blood. Written by HealthInfo clinical advisers. Endorsed by community respiratory physician, Canterbury DHB. Page created September 2016. Last updated August 2018.